Wordbird was thrilled to win two awards at the ceremony in central London last night. 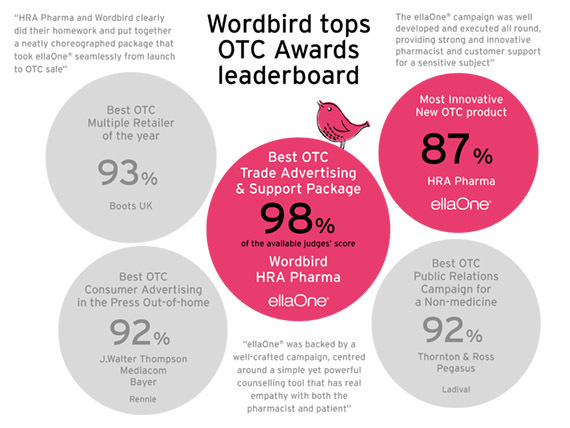 Wordbird won in both their categories - Best Pharmacy Training and Best Trade Advertising and Support Package for their work on HRA Pharma’s innovative emergency contraceptive, ellaOne®. They also supported HRA Pharma UK as they won Most Innovative New OTC Product. ellaOne® is the most effective morning after pill, launched to UK pharmacists in April 2015 after an EU wide switch. Emergency contraception is a sensitive subject so the challenge was to devise simple tactics to ease women’s journey within a pharmacy. The care with which the campaign was created impressed the OTC judges as they said “ellaOne® was backed by a well crafted campaign, centred around a simple yet powerful counselling tool that has real empathy with both the pharmacist and patient”.